The Edit Primaries tool allows users to add, remove, and exchange primaries or the paper/substrate in existing measurement data. In typical print production, adding or swapping ink(s) requires the expense of printing a complete, full size test chart. The Edit Primaries tool simply requires the spectral data of the new ink(s) to be added or exchanged. 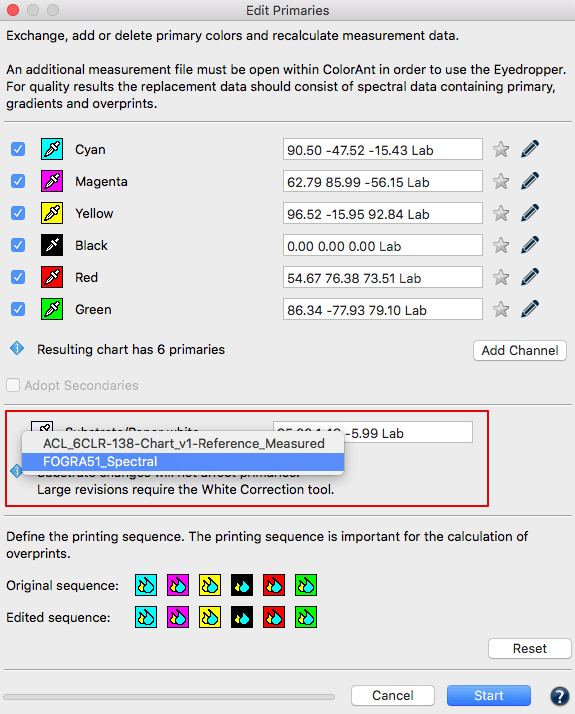 It also recalculates all overprints based on intelligent spectral color models. One of the major features of the Edit Primaries tool is the ability to dynamically select the best patches from the data provided. The more complete the data (spectral data is preferred) the more accurate the results. Spectral data in general, providing the printing sequence information. This allows creating of new ICC profiles for new color combinations quickly. Variance in press condition: The characterization press run is slightly deficient in solid ink density or hue on one or more colors. Exchange of paper/substrate: The inks are the same but a slightly different paper is used in production or a specific job. Create a new set of characterization data that swaps in e.g. Blue for a Cyan or a Rhodamine Red for Magenta. 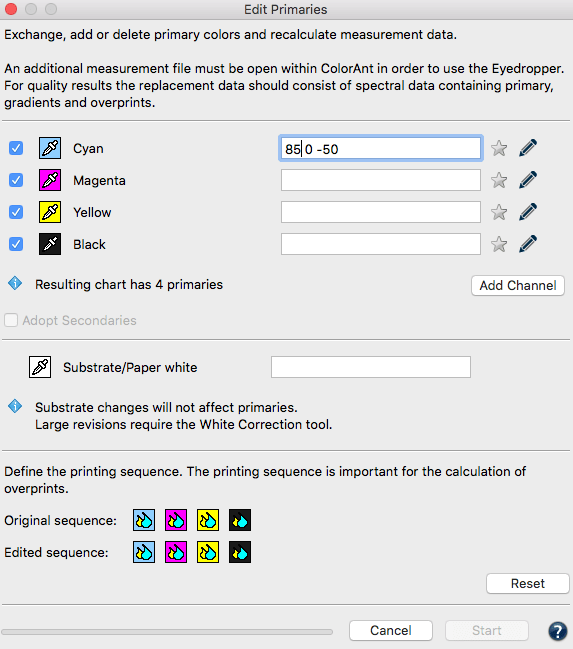 Adjust Printing Sequence: Allows improved overprint calculations. Watch an example here. Flexibility for packaging customers: Create different color variants from a full blown 7 color press characterization data set by deleting channels to create new characterization data sets without printing a new test chart. For example, from an 7C data set (e.g. CMYK+Orange+Green+Violet) build variants for CMYK only, CMY+Violet, CMYK+Orange+Green or other combinations. Ensure that the printing process is stable and use the color combinations you need to fulfill the respective customer orders. 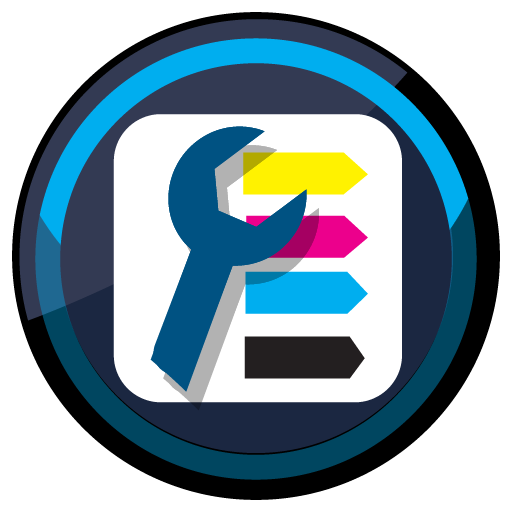 Increase CMYK gamut: Adding a 5th, 6th or 7th color to a CMYK printing process. Modify channel names: Reorder channel names without data modification. One of the main features of Edit Primaries is the exchange of primary colors creating a new set of characterization data. 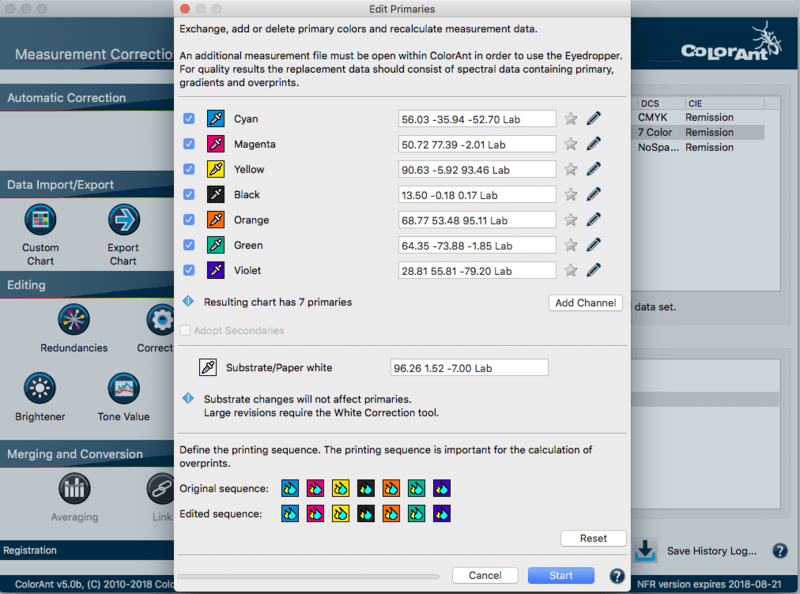 Load the measurement data of the test chart to be edited in ColorAnt, then load the data set containing the measured new primaries, including gradations of the primaries and overprint information. A sample of a reference file for CMYK plus one spot color is included with ColorAnt. The wedge Spotcolor-CMYK+X-v1.txt (shown as Red spot color in the screenshot) is located under File/Open Predefined. Use the tool Export Chart to generate a printable wedge. Click on the measurement data to be edited (to select it) and click on Edit Primaries. Exchanging a primary: Click on the eyedropper icon of the color to be exchanged (see screenshot demonstrating an exchange of Yellow). Select the new primary from the second data set loaded in ColorAnt. To do so, click on the channel containing the new primary. Selecting a color from another channel of the same data set is also possible. In Edit Primaries the Lab value of the new primary will be shown allowing you to check immediately if the changes have taken place. If the imported measurement data are spectral data the star will be highlighted. 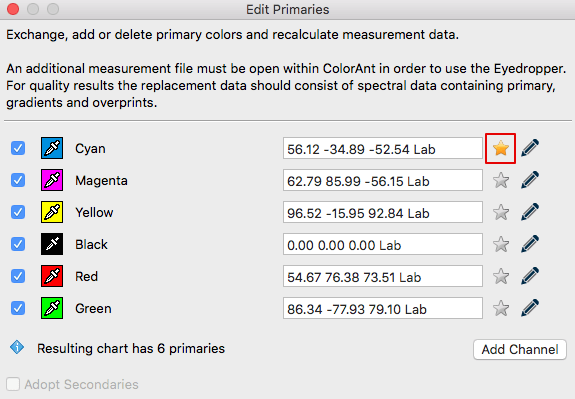 If two or more primaries are added from a single data set containing overprints of these primaries, then these measurements can be used by ColorAnt and the checkbox Adopt Secondaries will be enabled. Note: Adopt Secondaries is only enabled if secondary colors are available in the selected data set. When moving the mouse over the text a tooltip will show the selected color combinations and the associated data sets. If no measurement data of the new primary is available, Lab values can be entered in the numbers box (however, calculations will not be as exact as with spectral measurement data). This will be visualized by a gray star icon. When complete click Start and the data will be modified and shown in the Data Sets section of ColorAnt. Save the new data with File/Save as to be used for other tasks, for example, creation of ICC profiles with ColorLogic CoPrA. To check the exchange of primaries, use the Compare tool to verify the data. If a solid color is used to replace a primary color but does not contain any gradation values, ColorAnt uses the gradation behavior of the original primary color. Edit Primaries dynamically selects the best patches from the data provided. The more complete the data (spectral data is preferred) the more accurate the results. The exchange of primaries will improve when providing gradations of the primary color and overprint information, such as the primary with black overprints or secondaries. Replacing the paper and paper color does not affect primary colors. This is intentional, because the tool assumes only small changes of the paper tone that do not affect the full tone of primary colors. If you would like to change the paper tone significantly, we recommend using the White/Black Correction tool prior to editing of the primary colors. Load the test chart measurement data and load the secondary file containing information of the measured paper white into ColorAnt. Select the measurement data of the data to be edited and click Edit Primary. Click on the eyedropper icon of the Substrate/Paper white and select the new paper white from the second data set. Click on the name of the data set to import the data. Alternatively, if no measurement file of the new paper white is available, the new values can be entered in the number field as Lab values. However, this is not as precise as working with spectral data. After you are done click Start and the data set will be modified. The modified measurement data can be found under Data Sets. Save this file under File/ Save as for further usage, e.g. creation of ICC printer profiles with CoPrA. The Printing Sequence defines the order in which the colors are printed on top of each other and can be set independently of the channel sequence. When primary colors are exchanged or added, overprinting colors can be correctly calculated by specifying the correct printing order. 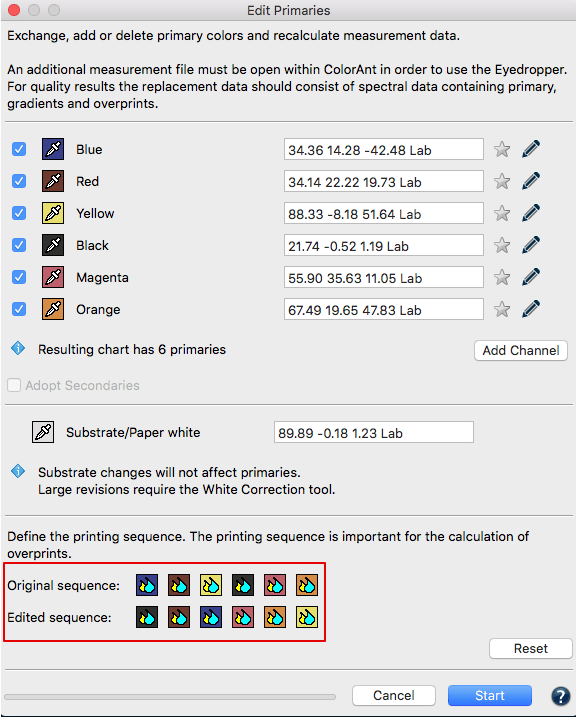 By changing the print sequence, you can also check whether a changed sequence increases or decreases the gamut. Example: There is a difference in color when a red is printed on a yellow or vice versa. 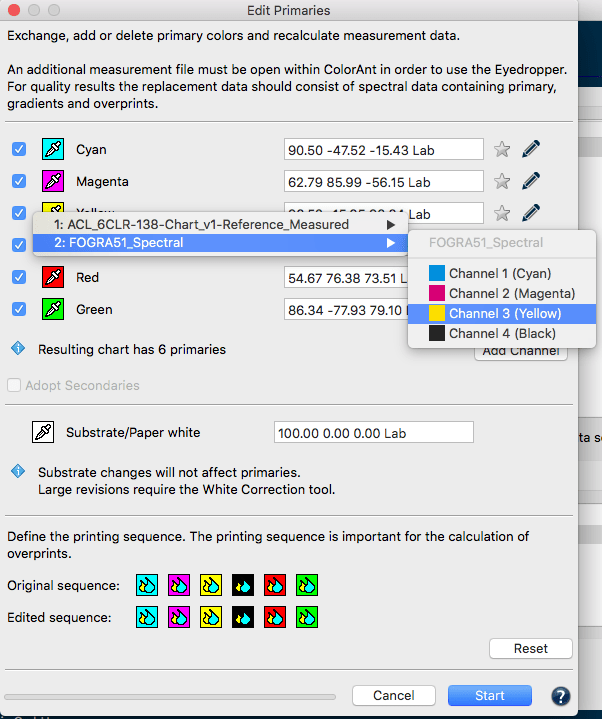 Users can set the print order independently of the channel order so that the channel order is maintained, for example as CMYK, even if the print order is KCMY. Load a measurement file under Data sets, preferably with spectral data, and open Edit Primaries. The initial print order, represented as the Original Sequence, of a loaded data set corresponds to the channel order. Change the Original Sequence by clicking on a colored icon and moving it to the desired position. Example flexo printing: The colours are usually printed from dark to light, whereas the channel sequence implies a different arrangement. Note: When an edited data set is reopened, the Original Sequence reflects what has been done and saved the last time. Edited Sequence specifies the order of the colors in which they are to be printed. Note: If you do not need to change the print order, make sure that the edited order is the same as the original order. After you are done click Start and the data set will be modified. The modified measurement data can be found under Data Sets. Save this file under File/ Save as for further usage, e.g. creation of ICC printer profiles with CoPrA. Note: To add channels a ColorAnt L license is required. Load the test chart measurement data and load the secondary file with the measured primaries, gradation and overprint information into ColorAnt. Select the measurement data you would like to edit and click Edit Primaries. Click on Add Channel. A new channel with default gray Lab values and the channel name Auto is added. Note: The Auto entry will take the channel name from the second data set. Click on the eyedropper icon of the new channel and select the new primary from the second data set. Click on the channel to import the data. Example of a 5th color (Red) being added to an original CMYK data set. To rename the channel click on the pencil icon and enter the desired name in the appearing window Edit Primary Name. Important: Define the Original Printing Sequence and the Edited Sequence. This is especially important when a new ink is added as it can be added as the last ink or placed in between other primaries. Click Start and the new 5 inks data set will be generated. ColorAnt will calculate modified measurement data which can be found under Data Sets. Save this file under File/Save as for further usage, e.g. creation of ICC printer profiles in CoPrA. 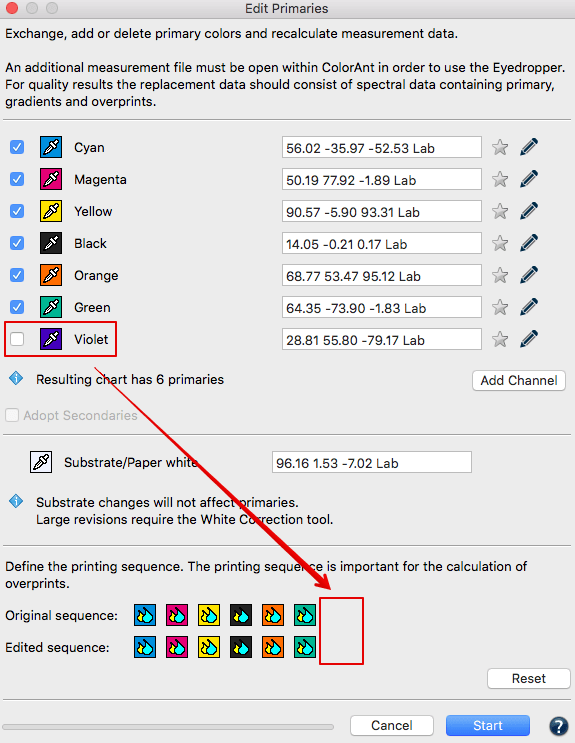 To examine the new data set, use the View tool and select the tabs 2D, 3D, SpiderWeb and TVI to check that all colors including overprints have been added correctly. The TVI curves of the 5th channel can be edited further by using the Tone value tool and/or other tools like Smoothing. 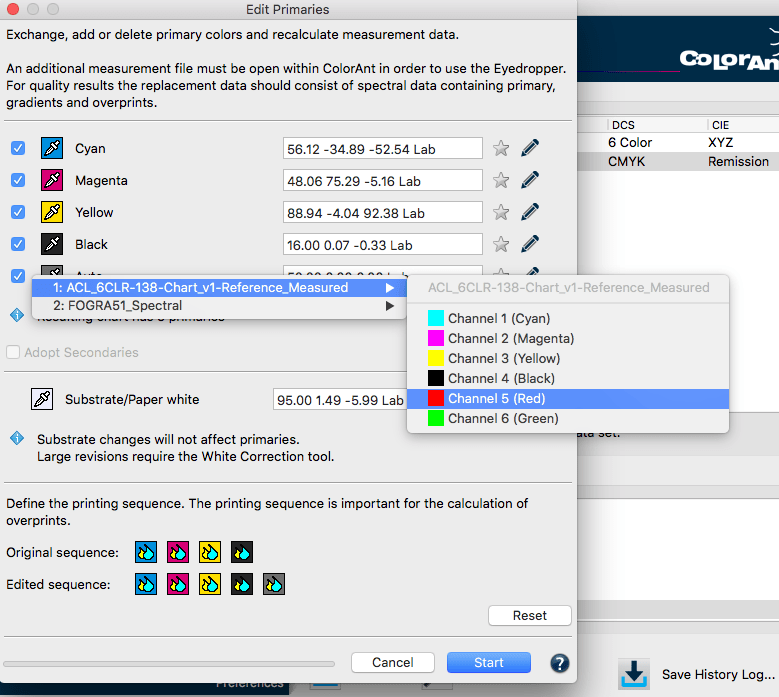 Finally, CoPrA can be used to build a 5 channel printer profile. Note: A ColorAnt L license is required to remove channels. Load and select the measurement data of a test chart and click Edit Primaries. Disable the checkboxes in front of the channels that need to be deleted and click Start. The information area of the Edit Primaries tool displays the channels of the resulting data set. The new data set will be reduced to the channels that have been enabled. Please be aware that this is a Multicolor file and may only be used in ColorLogic CoPrA if a Multicolor license is loaded. Note: Edit Primaries can be used to extract individual channels from complete test chart measurement data by removing all other channels. Just leave the checkbox of the desired channel activated and deactivate the checkboxes of all other channels. The channel order can be changed within a file without changing the measurement data itself. For example, if you have added the additional channels Orange and Green to a CMYK data set you can change the order to CMYK+Green+Orange afterwards. Simply click on the eyedropper icon and select Orange for Green and Green for Orange from the same measurement data file. This will change the channel order without changing the measurement data. If only the channel order has been changed, this is indicated by the name ChannelOrder in the file name. 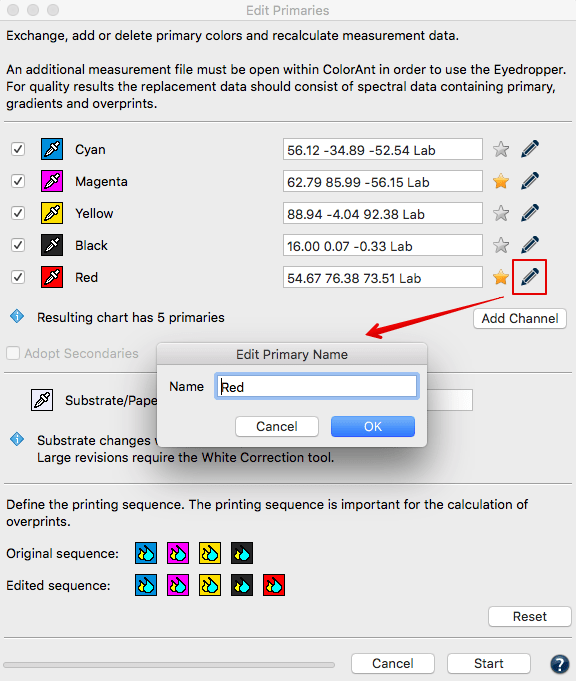 Note: The channel reordering feature in Edit Primaries and the Link tool Merge by Channel Name can be used to prepare Multicolor measurement data from different origins. 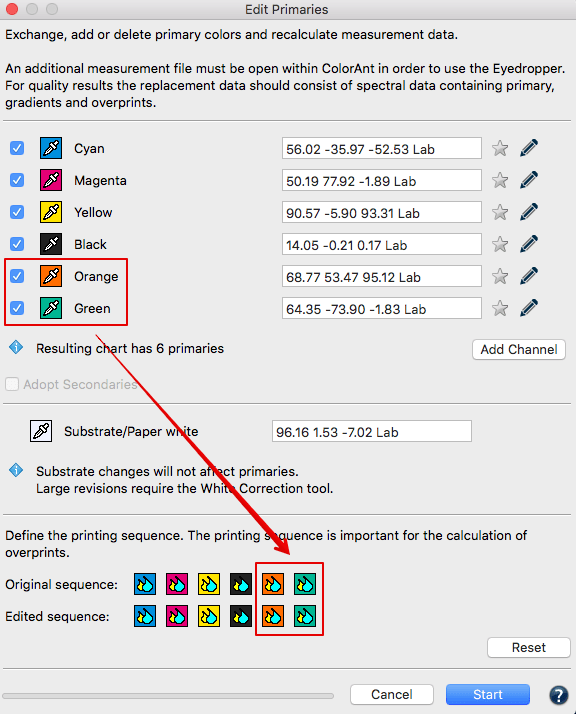 For example it allows to combine the four separate 4 color Esko Equinox files to a 7 color Multicolor data set to be used for profiling in CoPrA. The Edit Primaries tool allows the assignment of new color values to device values (DCS values) which do not already contain color values. Thus, new characterization data can be created based on CxF/X-4 data, existing wedges of primaries, the input of Lab values or other characterization data sets without the need to reprint test charts. Open a reference file (for example IT8/7-4) and, if available, measurement wedges or existing characterization data of test charts containing the desired colors. Select the reference file, click on Edit Primaries and use the eyedropper tool to choose colors from the pool of measurement values. Alternatively, fill in the Lab value if there isn’t other data available. The best results are achieved using spectral values, wedges or information on overprints. If measurement values are assigned to all primaries and the paper white, click Start. The integrated progress bar shows the status of the calculations. With complex mathematical calculations, especially with large test charts and many channels, you are always informed how long these can still last. When extracting measurement data containing overprint information with black from CxF/X-4 files (so-called full characterisation), you should note that no black gradient is stored in CxF/X-4 files. If you want to edit a black channel with gradient in Edit Primaries, you should use the black gradient from another measurement file and not from the CxF/X-4 file.